Looking for a car seat? Check out the best Graco Extend2Fit Deal out there! Target currently has a 3 colors of the seat marked down to $143.99 here (Regularly $199.99, colors are Mack, Rosie & Gotham). Promo code GRACO5 brings them down to $136.45 and RedCard holders score an additional 5% off bringing them down to $129.99!!! (If you are not a RedCard holder, Target is still running a promo to receive an extra 10% off coupon, you can check out the details here! Target is offering 5% off all Graco Baby items with promo code GRACO5, combined with markdowns, there are some great deals! Here are a couple others we found! 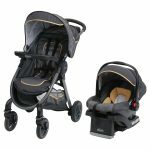 FastAction Fold 2.0 Travel System in Sunshine: Regular price: $259.99, marked down to $125.99 (so already over 50% off). Promo code GRACO5 brings it down to $119.69! If you have RedCard, it drops down to $113.71! That’s cheaper than the car seat alone for the whole system! Grab on here! 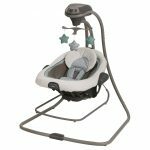 Graco Duet Connect Swing & Bouncer in Manor: Regular price $159.99, marked down to $80.80 (almost 50% off). GRACO5 brings it down to $76.76. RedCard holders save an additional 5% bringing it down to $72.92! Check out all of the items eligible for an extra 5% off with promo code GRACO5 here! Many are already marked down quite a bit! Previous Post Banzai Slide N’ Soak Splash Park $209.99 + $40 Kohl’s Cash! Next Post Best of Nordstrom Markdowns for Moms!